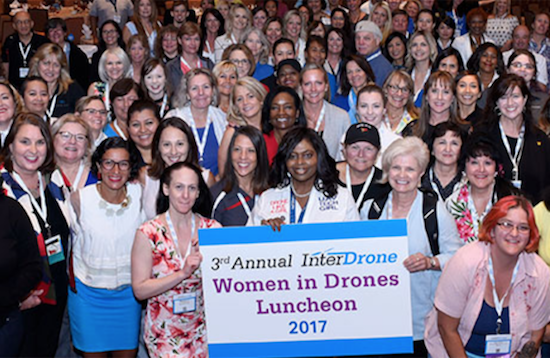 NEW YORK—July 10, 2018—Emerald Expositions, the largest operator of business-to-business trade shows in the United States, announced plans today for InterDrone's fourth annual Women in Drones Luncheon, a special event it spearheaded in 2015 and has quickly grown into a model for networking in the commercial drone industry. InterDrone will take place at the Rio Hotel in Las Vegas, September 5-7. The luncheon will be on Thursday, September 6, from 12:15 p.m. – 1:30 p.m.
"This is an incredible time for women to enter into this emerging field, to participate in these new developments, and to pave a pathway for more girls to enter into STEM careers. I look forward to moderating the luncheon panel to help build networking opportunities for more women and girls," Lemieux said. "The event this year is also particularly exciting since we are thrilled to announce a partnership with Women and Drones," said Katie Flash, content director, InterDrone, adding, "Our event strives to highlight all the amazing things women are doing in this space, and this partnership allows us to take that to the next level." The collaboration with Women and Drones is the largest online platform for women in the UAS industry. The purpose is to reveal the 2018 Women to Watch in UAS list of honorees during the luncheon. "Women to Watch in UAS recognizes exceptional women in the industry from around the world. We received hundreds of nominations this year and are in the midst of a rigorous process, reviewing each submission and validating the information. The finalists will be selected by our judges very soon, and the honorees will be announced at InterDrone," Rossmark said. For information on exhibiting or event sponsorships, please contact Brian Scott at [email protected] or 646.668.3784. WomenandDrones.com is the largest online platform for women in the UAS industry. The organization enables women to collaborate and make global business connections to grow their network. Their educational platform "learning through the wonders of flying robots" encourages children, especially girls, to develop an interest in science, technology, engineering, arts, and math.